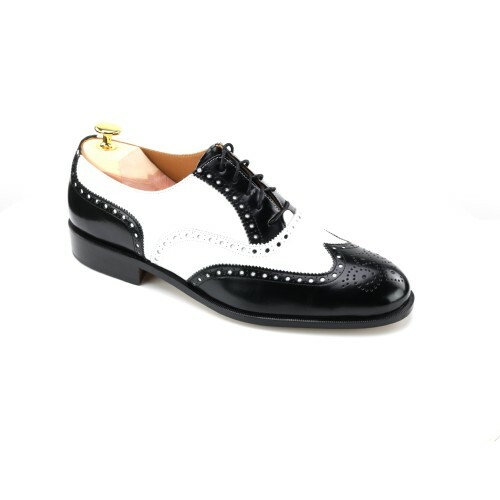 Spectator Shoes bring out the gangster in yourself with the Chicago two-tone Brogue in Black and White Calf. The godfather of all Brogues, this elegantly flagrant two-tone wing-tip harks back to the dangerously well-dressed Al Capone and the bootlegging barons of the Roaring Twenties. Now the tradition of gangsta chic is revived by today's flamboyant public enemy's as London soccer stars and New York divorce attorneys alike find these shoes are an offer they can't refuse. We've seen these referred to under a number of names such as 1920s shoes or 1930s shoes, Gatsby shoes, spats shoes, two tone brogues and two tone shoes. Our cousins over the pond refer to all brogues as Wingtips, and that terms is becoming more common usage here too. Clearly a popular item and back in fashion along with all brogues. Often seen on the feet of Footballers at their weddings rather than Newspaper men today. Shipton & Heneage just receive my shoes. Those shoes are beautiful you guys make a Great product I will see you again.